Richard Tindall, of Strothers and Tindall (Precision, Investigation, and Development Engineers), is missing. He wasn't in his bed when his daughter got up and it looked like he never returned home the night before. He isn't at his office. And then a body is found in a church tower under the wreckage of a huge sculpture which had been temporarily stored in the tower. And thus begins a mystery with a very complex solution. Inspector C.D. Sloan is sent to investigate, and takes along Detective Inspector Crosby, who often (always?) features in these stories. Crosby is generally inept and not much help in the investigation; he is good with cars but that is about all. Sloan is unusually grumpy with Crosby's foibles in this book, or so it seemed to me. I found the story especially interesting because Tindall's company is involved in research and development in the scientific area, there are other businesses competing to buy the company, and the staff is somewhat eccentric. There are many suspects and red herrings. I did not catch any clues to the killer but I did have an inkling who it was, probably just because I read so many mysteries. The writing itself is not spectacular but I enjoyed the story all the same. It must be the characters, her way of developing the plot, and the humor that keeps me coming back for more. There were some good clothes descriptions also, that tell the reader something about the characters. Here Inspector Sloan meets Fenella, Richard Tindall's daughter, for the first time. It was high summer in England and this girl was wearing brown. Not a floral silk pattern, not a cheerful cotton, nor even a pastel linen such as his own wife, Margaret, was wearing today. And dark brown. It was a simple, utterly plain dress, unadorned save for a solitary string of white beads. Sloan wasn't a purist. He was a policeman. On duty. He took a step forward. I have now read five of the Sloan and Crosby series by Catherine Aird, and I can say that she is one of my favorite mystery writers. Some of the books in this series are more serious, although they all have elements of humor. I would put Henrietta Who? and A Late Phoenix in that category. Also The Religious Body which I read before blogging. For that book, see this Spotlight by Margot at Confessions of a Mystery Novelist... This book and The Stately Home Murder are more on the lighter side, emphasizing the wit and humor more. See other reviews at Clothes in Books, Tipping My Fedora, and Classic Mysteries. Aird's Sloan series is a good one, isn't it, Tracy? She's created some solid, intricate plots, and I like the interaction between Sloan and Crosby (even if Crosby can be annoying). Glad you thought this was enjoyable. I hope to continue through the whole series, Margot. There are 24 books now and one coming out in 2019. Another author that I've seen and not read. However, I always learn new things here, Tracy. 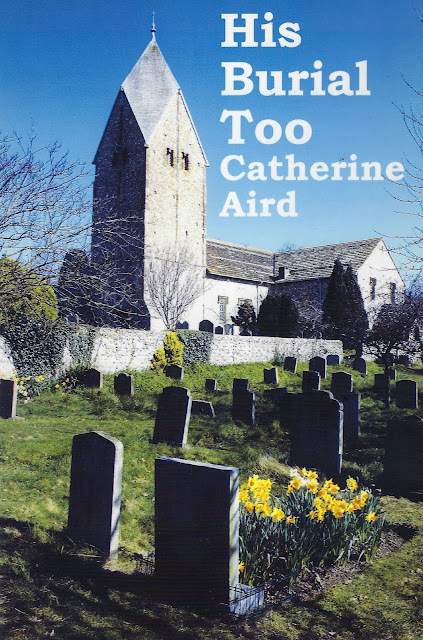 I really like the 2nd cover you show - nice contrast between the gravestones and the flowers. I agree, Kay, that graveyard photo is very nice. I liked the cover with the broken up sculpture also because I was having a hard time picturing how the death happened. It was a locked room / impossible crime but it was the other elements of the story I liked. Glad you enjoyed it, but maybe a bit tame for me - sorry. I can't help it I like what I like! Definitely too tame for you, Col, but then many of the books you like are too dark and violent for me. I can take those elements in small doses. You had me with "humor" and "characters," Tracy (complicated plots are not my favorite feature). I shall have to take a look at Ms. Aird. Plenty of humor and plenty of interesting and humorous characters, Mathew. At least some of the books are available as ebooks. 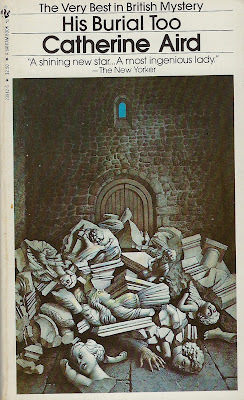 I read and enjoyed this one years ago, the fact that it was a locked-room mystery its primary attraction. Barry, I did not realize until I commented above that it was a locked-room mystery that I had not even mentioned that in the review. That is not my favorite kind of mystery but this one did work well for me. I enjoyed this one, it had some really weird features in it, like the giant sculpture, and as I remember a very unlikely plot. She is always an entertaining read I think. The plot was very unlikely, Moira, but then I did not know that until the end so did not care so much. I do find her books very entertaining.